1. Crush the grapes to break the skins. It is not necessary to de-stem them. Keep the grapes as cool as possible. 2. Test for total acidity. If the acidity is less than .65%, add enough tartaric acid to bring it up to that level. 3. Test for sugar with your hydrometer. Correct any deficiencies by adding enough sugar to bring the reading up to 20° brix for most varieties (22° for Sauvignon Blanc and Chardonnay.) If higher than 26° brix, add water to lower it between 22° and 26°. 4. When these tests and corrections have been completed, the must may be sulfited. Estimating that you will get roughly a gallon of juice from every 16 lbs. of grapes (varies with the variety), add enough sulfite to give you a sulfur dioxide (SO2) level between 50 and 120 parts per million (ppm.) Note: The amount needed will depend on the condition of the grapes, with moldy grapes getting the most concentrated dose. Very clean grapes may get by with little or no sulfite. 5. Stir in pectic enzyme (pectinase) at the rate of one ounce to every 200 lbs. of grapes, or use Lallzyme® Cuvée-Blanc. Place the crushed grapes in a covered container to macerate from 2 to 12 hours. If left to stand longer than 2 hours at this stage, the crushed grapes should be refrigerated. 6. The grapes are then pressed to separate the juice from the skins. Funnel the juice into topped up containers, cover, and let stand for approximately 24 hours. 7. Siphon the clear juice away from the layer of settlings (called "gross lees") into a glass, stainless steel, or oak fermentor which is filled no more than 3/4 full. (If using FT Blanc Soft Enological Tannin, mix it with the juice during the transfer to the fermentor(s). 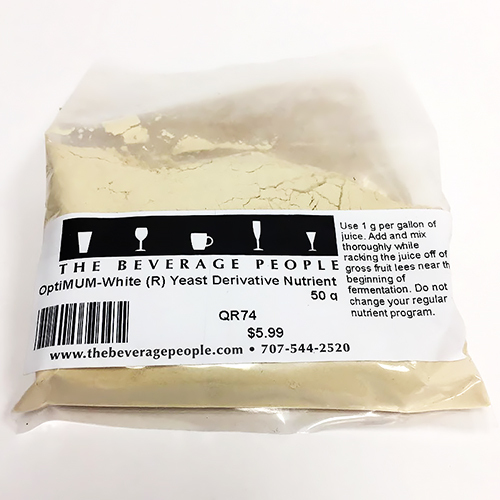 This is also the time to add Opti-MUM White® Specific Inactivated Yeast if desired.) Yeast should be added, 1g per gallon and a fermentation lock attached to the fermentor. Add nutrients such as Fermaid K and/or DAP. 8. When visible signs of fermentation end, the wine must be racked off the lees, and placed in topped up storage containers (glass, stainless, or oak). Add sulfite, 30 - 40 ppm. and let stand for a month. 9. Rack off the lees. If the wine isn't clearing, fine with Sparkolloid or a Bentonite slurry. Clarity occurs by three months. Sulfite and store full containers in a cool place. 10. In a couple of months, rack and sulfite the wine again, placing it back in topped up containers. For oak flavor add oak sticks or cubes. 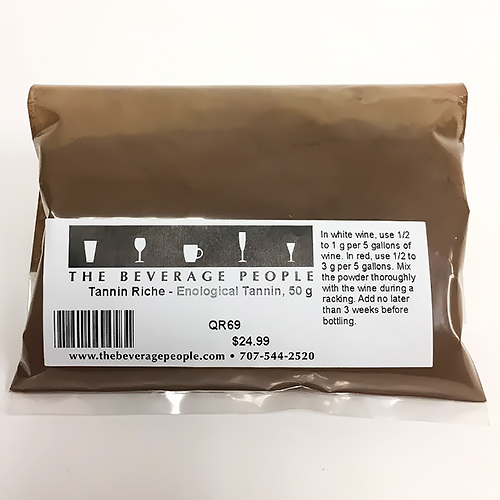 If additional high-quality French oak character would benefit your wine, use Tannin Riche enological finishing tannin. 11. In late Spring, before the onset of very hot weather, carefully rack the wine from the lees. 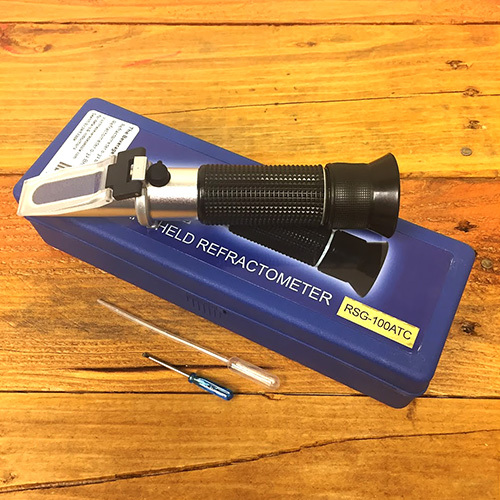 Test the wine for free sulfite content with a sulfur dioxide test kit to determine how much SO2 is needed to bring the level to 30-35 parts per million. 12. Siphon into bottles, cork them, and set them aside for whatever bottle aging is needed. If you wish to sweeten the wine, do so with simple syrup (two parts sugar to one part water, boiled), and add 1/2 tsp. Sorbistat per gallon to inhibit any remaining yeast. 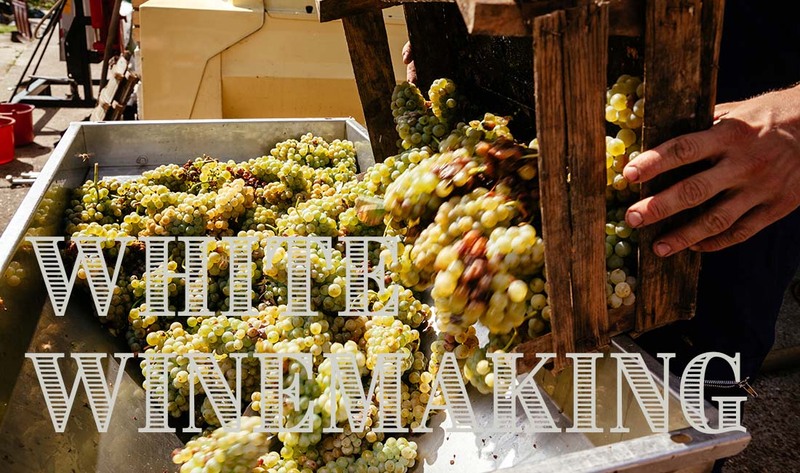 White wines may be enjoyed 6 weeks after bottling. Rack to bottling container, add sulfite, fill and cork bottles.